Give your complexion a flawless-looking finish with Mirenesse foundations, powders and makeup. Mirenesse makeup is available in a variety of different formulas. For a natural-looking matte finish in a liquid foundation, try the Mirenesse Liquid Silk Foundation Mineral Matte Finish with SPF 15+. This mineral foundation helps to absorb oil and give your skin an even-toned look. Give your skin a photo-ready, airbrushed finish with the Mirenesse Emulsion Pact Soft Focus Foundation. This compact duo contains a light and dark powder foundations so you can highlight and blend to achieve your perfect look. Set your foundation or give your skin a sun-kissed glow with one of the Mirenesse powders or bronzers. These powders are available in traditional compact for touch-ups on the go or in a loose powder form. 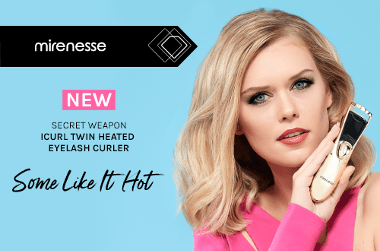 Mirenesse is proud to be Australia's Number 1 online beauty brand. Their Award Winning, advanced technology makeup and skincare products do not contain synthetic fragrances, mineral oil, alcohol or sulphates. Mirenesse is a registered PETA company. It’s a bit tricky to use but with practise it works quite well. I’m using a lash serum so my lashes are quite long but they grow straight. It also takes some time to curl but when done right lashes look really nice. No risk of burning. I bought this in the hope that it would add length and separation to my thick lashes. Instead, I found that I was spending ages with other mascara brushes trying separate my lashes after applying this mascara. It might be good for thinner lashes, but not for mine. This mascara is a game changer. Zero smudging and easily removed with only water. Why anyone would use anything else is beyond me. This is perfection.